‘Daddy’s Home 2’, out now on DVD and Blu-Ray, is the sequel to ‘Daddy’s Home’ which came out last (year?). The first one was pretty good - I wasn’t expecting much as it just looked like your run-of-the-mill American comedy, but I was pleasantly surprised by how good it actually was. This time round I again wasn’t expecting too much as ‘Daddy’s Home 2’ is a sequel and again, the trailer made it look like a run-of-the-mill American comedy, but this time my expectation vs. reality went entirely the other way. In case you haven’t watched the first one, the general idea of the story is that Brad (Will Ferrell) is now Stepdad to the two children of his current partner Sara (Linda Cardellini), but has to compete against their super-cool and overly competitive Dad Dusty (Mark Wahlberg). Fast-forward to the end of the film and thankfully it’s all worked out (despite some bumps in the road) but the two of them are now happy to exist alongside each other, and the kids also seem happy with this. In ‘Daddy’s Home 2’ it again all seems fine until we learn that actually, the kids aren’t enjoying the whole two Dads thing, which is made publically apparently during a school play. Dusty and (character) come up with the idea to spend Christmas all as one big happy family this year, and also both invite their Dad’s (played by Mel Gibson and John Lithgow), who don’t get along as planned, plus Dusty’s new girlfriend and her phone-absorbed daughter. I’m if I’m honest I don’t really know where to start with this one, because… well, it just wasn’t good. I was confused when I first started watching as the film immediately looked so different to the first - dodgy visuals and text appeared on the screen, and the cinematography was shoddy at best which makes it look and feel like a B-rated TV episode from the ‘90s. There’s a lack of cinematic shots, and at points scenes are cut in strange places, leaving it disjointed and far from enjoyable to watch. Of course, it’s a comedy and so I wasn’t expecting it to be breathtaking in this respect, but they probably could have gone to a bit more effort. It actually feels like an entirely different film so I was surprised to learn that it’s written and directed by exactly the same people as before (Sean Anders and John Morris, in case you’re wondering). 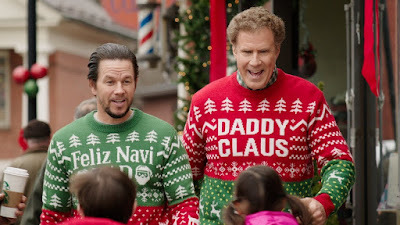 The issue can’t be the acting as we’ve seen from the first one that Ferrell and Wahlberg can have a great chemistry together on-screen, and yet even they couldn’t save it. Mel Gibson’s introduction didn’t help either as he plays a bitter antagonist with no redeemable qualities whatsoever. There’s a lot of jokes but most of them fall flat as they just aren’t funny, and some of these seem over-stretched and like the only reason, they’re actually there is to make it seem like there’s a story (the thermometer scene, to name a few). John Cena also makes an appearance as Dusty’s rival, so if you’re into wrestling or just Cena himself then I’d strongly advise you keep a wide berth so your opinions aren’t tainted. There was one scene that I felt was really good which took place in a comedy club and focused more on Lithgow’s character as an individual rather than the main story, but this was far more emotional than comedic and so perhaps that was why. Unfortunately, I knew it was going to happen which made it less effective, as the foreshadowing in the first twenty minutes or so is so heavy that you somehow know the entire outcome of the film before watching it. To sum it up, ‘Daddy’s Home 2’ feels like one of those awful family Christmas movies that you have to endure to keep Grandma happy while the roast is cooking. Although it was a good idea to start with, it’s poorly delivered and the fact that it’s a Christmas movie does not serve it well. You won’t even notice the message it’s trying to get across as you’ll likely have switched off by that point. It has shown one thing though - sometimes it’s better to quit while you’re ahead. You always know exactly where you stand with a Disney film. As soon as you see that magical palace and hear the When You Wish Upon A Star tune, you can be safe in the knowledge that over the next two hours, you will laugh, cry and everything in between. 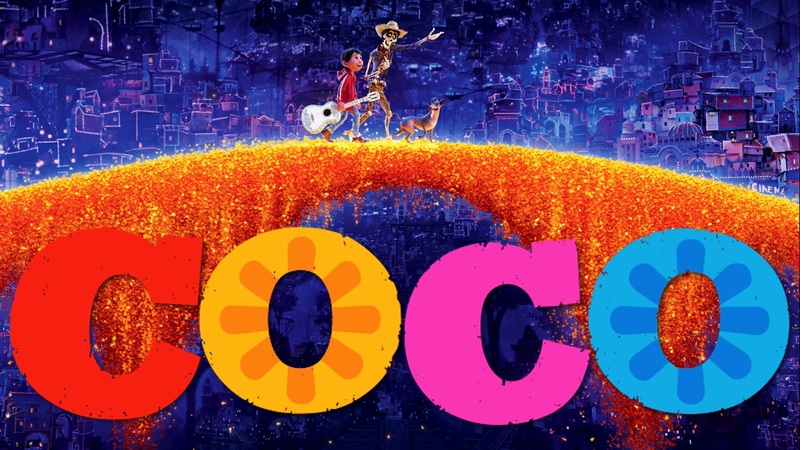 Their latest collaboration with Pixar, Coco, is no exception to this rule. I laughed. I cried. And as the end credits began, I leaned back into my seat and tried to figure out where Coco sat in the Disney rankings. It is definitely in the Top 5. A bold claim, perhaps – but certainly deserved. In true Disney fashion, here’s a film based entirely around a culture and setting that will be largely unfamiliar with young children in the UK and US where the film has been enormously successful – but thanks to a respectful and passionate portrayal of this culture, Disney has made it accessible and introduced it to youngsters in an effective way. Coco is quite a good companion piece for Moana – a film which also introduced a different culture to a young audience. Furthermore, both films aren’t at all interested in a romance, but instead, focus on our hero’s inner quest alone. These stories are inspiring for any children with hopes and dreams. As always, Coco is not just for kids. As well as the aforementioned universal themes, there are some great references to historical figures littered throughout - Frida Kahlo, in particular, makes for some amusing comic relief as she plans a performance that involves dancers (dressed as Frida) emerging from a flaming papaya and drinking the tears of a cactus (also dressed as Frida). The Disney humour, as always, never stoops low to juvenile fart jokes – it is funny even to us grown-ups. And if you’re not moved to tears by the last 10 minutes, regardless of your age, then you should book an appointment with your GP because you’re probably dead inside. Coco is a masterpiece. There is nothing at all wrong with it. Disney have crafted another slice of cinematic perfection for their beautiful catalogue of adventures, and we’re so lucky to be on the receiving end of their output! I saw the film twice in the cinema and found it equally wonderful both times. This is one that can stand comfortably among Toy Story and Up and will stand up to revisits for many years to come. Coco is an unforgettable masterpiece - not just of animation, but of cinema in general. Even if you’re not an artist, you’ll still likely have heard of Vincent Van Gogh, a highly influential Impressionist painter considered one of the greatest Dutch artists of all time. Nowadays his work is adored and appreciated by all, and on a personal level, he is the artist that inspired me to take up oil painting (which I still do now). 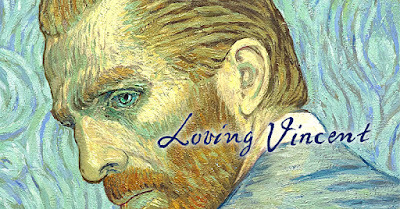 Unless you’re on the art radar though, you might not have heard of ‘Loving Vincent’, directed and written by Dorota Kobiela and High Welchman - a relatively short film dedicated to his life, death, and the mysteries surrounding both of them. Due to my passion for his art, I was slightly nervous about watching it; there’s nothing worse than a film or book that fails to engage even those that were highly engaged in the first place. The thing that makes this film special isn’t that it’s a beautiful biopic of such an inspirational man, but that the entire film is painted in the style of Van Gogh’s work himself. It was painted by a team of over 100 artists, each highly proficient in the distinctive style, and overall uses 853 different paintings to create the final moving image. I can only imagine the work that has gone into it; I’ve painted many of Van Gogh’s paintings, sneaking him into every art project I ever did at school, but they’d always take so long - 853 of them doesn’t even bear thinking about. The story itself is told through the eyes of Armand Roulin (Douglas Booth), son of the postmaster Joseph Roulin (Chris O’Dowd) who consequently became friends with the late Vincent Van Gogh (voiced by Robert Gulaczyk) after having to deliver so many letters between him and his brother Theo. Now, Vincent is dead Armand is tasked to deliver Vincent’s final letter to Theo, and so reluctantly sets off to find him. Theo has also passed away though, and as he searches for someone to deliver the letter to he also discovers many conflicting opinions surrounding Vincent’s death. Despite it being widely accepted that Van Gogh committed suicide, every since the 2011 theory explored in this film came to air there’s been a lot more speculation about the fact that maybe it isn’t all it seems. ‘Loving Vincent’ does a good job of exploring this, though it also doesn’t come to a standalone conclusion, meaning you’ll probably still be pondering it after you’ve watched it. Admittedly the story could have been slightly more capturing - certain parts could have been explored more in-depth, and the switches between Armand’s present and Vincent’s past through dialogue become somewhat repetitive after a while. It’s still intriguing though, but I wonder if maybe its target audience is solely people already interested in the life of Van Gogh, rather than also including those yet to know about it. There’s a real emotional element to it all though, and I think even those new to the Van Gogh scenes would struggle to feel nothing as we witness harrowing scenes like Van Gogh crying and bleeding into his pillow now missing an ear, set against haunting melodies and prolonged as bleak paintings that etch into your mind. What makes this film work (and again, is most likely targeted towards the artists among us) is just how beautiful the painted side of it is. If you are an artist then you’ll spend half of the film going “Oh look, that’s Starry Night On The Rhone/Café Terrace At Night/Wheatfield With Crows!” and the other half itching to get your paints out and find the nearest field to capture. The rotoscoping isn’t perfect (it rarely is, though), but seeing it in Van Gogh’s style is so much more pleasing than just watching a standard film. The first fully-painted film ever to grace our screens, ‘Loving Vincent’ is something pretty special. It may have taken 7 years to complete, but it was worth every second. If there's one character I shouldn't need to write an introduction for, it's Mario. His games have redefined the platform genre, several times over. Super Mario Bros. basically invented the side scroll. Super Mario World and Mario 3 still hold up today as two of the best games ever made. Then there's Mario 64, which set the way for all 3D platform games to follow. He's also pretty good at tennis, golf and cart racing, to name just a few of his hobbies. Once again, Princess Peach gets kidnapped by Bowser. Who, creepily, plans to force her hand in marriage. You'd think she'd learn to hire some better security for her castle. Toads seem to be about as capable as Princess Bubblegum's Banana Guards. Mario tries to stop Bowser but is thrown from Bowser’s flying ship by rabbit wedding planners, called Broodals. Mario's infamous hat gets destroyed but luckily he wakes up on Cap Kingdom, a Kingdom inhabited by magic sentient hats known as Bonneters. (Nintendo have definitely been smoking something on this one). He soon befriends Cappy whose sister, Tiara, was also kidnapped by Bowser. They travel to the nearby Cascade Kingdom to recover the flying ship and games namesake “The Odyssey” and begin to chase Bowser and the Broodals across the World. Nintendo has gone back to the more open ended level design, of Mario 64 or Mario Sunshine, encouraging exploration and experimentation with the game's new mechanics. Each level is filled with hidden Moons to find, often by completing set objectives, a bit like the stars in Mario 64; only more plentiful. Levels are mostly well designed and fun to explore, except for the few areas that seem to serve no purpose other than to make the level feel superficially larger than necessary. This could possibly be to hide a load point, to allow the game to render in the next section without stopping the flow of the game, but if that's the case then they kind of failed anyway. This doesn't occur too often though, so just me being overly fickle. I love the sensation of momentum you get from Mario as he runs around. Accelerating downhill and seeing Mario sticking his arms out like an aeroplane is pretty funny. Cappy becomes an extension of yourself, using him to bounce off of, for an extended jump, spin attacks or hit and pick up things from a distance. There are no “power ups”, this time around, gone are the infamous Mushrooms and Fire Flowers. No Catsuit, Feather or Leaf. Instead, throwing your hat companion onto enemies or animals, in the world, will give the player control of the unsuspecting sentient beings. Mario will vanish into, what I assume to be the same dimensional space as Optimus Prime's trailer, each time he transforms. Via this unsolicited mind control, Mario gains all sorts of new moves and skills, allowing him to reach previously inaccessible areas and find more moons to collect and power The Odyssey. 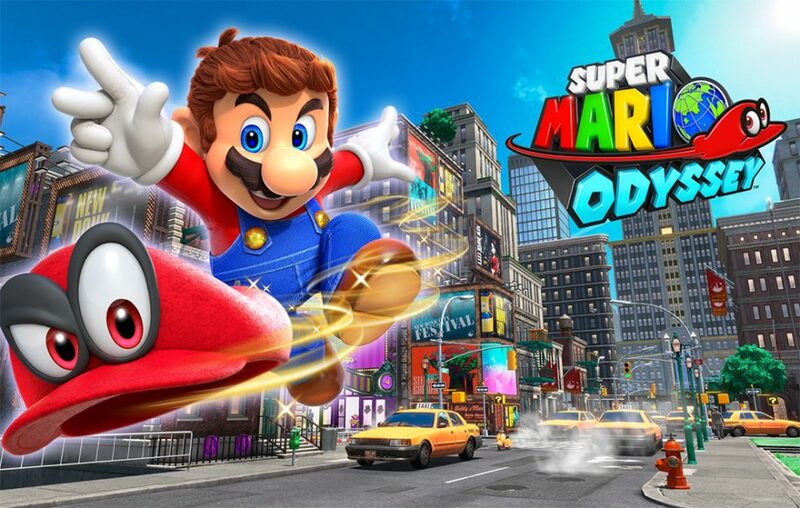 Take control of a frog and Mario gains the ability to leap tall buildings with a single bound or the little Easter Island heads, with their shades from "They Live", giving Mario the ability to see what others can't, each time he puts them on. ...Or just be a Dinosaur. Because dinosaur. This brings up the question, is Mario in control of the hat or is the hat controlling Mario? While I'm asking questions with no answers... How does Bowser put his suit on, Can he take his shell off? For some reason, I can suspend my disbelief and accept that Mario can talk to, and help out, Seals or a Penguin, that talk like the parents from a Peanuts cartoon. And he has a strange rivalry with some sort of punk turtle that rules his own Kingdom and shows no remorse to 30 years of kidnapping felonies. ...but New Donk City humans look weird and make the world of Mario even weirder. Mario Odyssey makes canon the idea that Mario isn't human and we've been controlling some humanoid Man like being, from another World, for the past 30 odd years. WIN £500 CeX Voucher with our Valentine's Day Competition! The best 2 movie scenes will win our prizes which will be announced on the 1st of March. Happy Valentine's Day from everyone at CeX! Evil Within is a horror game, at its core, from the creator Shinji Mikami. Best known for Resident Evil (1 - 4), Devil May Cry, Vanquish and, the sadly underappreciated, Shadows of the Damned, to name a few. With his name behind some of the best known and influential games, since 1996, I was expecting Evil Within to be something more than a cheap and inferior 'nod' to Resident Evil 4. With an unrelatable and uninspired protagonist, that you're never given a reason to give a crap about or a strong enough incentive to continue playing his mundane adventure. Gratefully, A lot of the issues I had with the original have been reconciled, with the series second instalment. You play, again, as Sebastian Castellanos. A dude that looks like John Wick, if he was played by a drunk and beat down Bruce Campbell. This time with a very valid reason of why you want to be this guy and continue on his elaborate and unlikely scenario of events and see the weirdness that's about to come his way. The game opens with Sebastian reliving his house burning down, with his daughter trapped inside. Which feels like a reverse play on the opening for The Last of Us. (and its similarities don't end there, but I'll come back to that). While Sebastian is drowning his sorrows, at his regular Bar of choice. He's approached by shady government types, known as Mobius, and his former partner, Juli Kidman. Juli tells Sebastian that his daughter never died in the fire and it was an elaborate ruse so they could kidnap her for sketchy secret experiments. She's still alive, only trapped inside of a machine called - STEM - that's used to go inside of other people's minds as a collective subconscious. Sort of like the Animus from Assassins Creed only with a bit of the dream diving machine from Paprika thrown in. - (If you've never seen Paprika but think Inception is good, you should check out where it got most of its ideas). Mobius proposition Sebastian into using STEM to search for his missing daughter, in return for finding and returning the missing members of the Mobius team, all of whom are also trapped inside. Once inside of STEM, which is also the name of the Engine the game is actually running on (ooOOoo, how meta) you soon wonder across someone I assume to be a friend of Bioshock's infamous and insane artist, Sander Cohen, leaving dead bodies on display like installation art pieces, a bit like the killers from the Hannibal series. Oddly beautiful, in their own grotesque and macabre way. Evil Within 2 is more of an open sandbox adventure this time. You can wonder the town of Union and approach objectives in any order you wish. Wondering off and exploring will reward you with extra weapons or parts for upgrades. 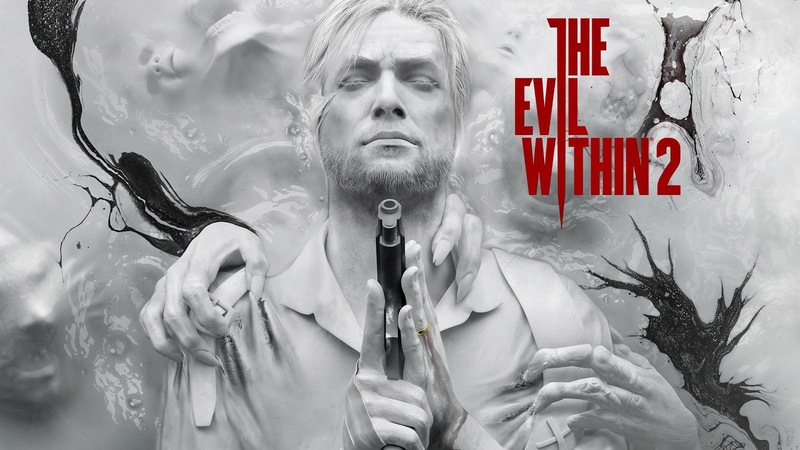 As I already mentioned, Evil Within 2 takes a lot of inspiration from The Last of Us, utilising a very similar creation system, for ammo and health, and with some enemies that are highly susceptible to sound and make an oddly familiar clicking noise, as they mindlessly wander the streets. Annoyingly, Evil Within 2 still controls like it's a 2008 over the shoulder, third person, Unreal engine game. And that's not a good thing. The camera is wedge right behind Sebastian, this is likely an artistic choice on the Devs part, to give a more claustrophobic atmosphere and create more tension but it just felt frustrating not being able to see what's in front of you or coming at yourself because Sebastian is taking up sixty percent of the players view. The game's story makes no sense but try to ignore that and fall down the rabbit hole. Take the red pill. Elop on the journey to the Silent Hill town inside of The Matrix. ‘My Little Pony’ has been around seemingly forever – I remember friends playing with the toys when I was in primary school, though I must admit I was too entranced by my Hot Wheels and Meccano sets to pay much attention. They certainly had some sort of appeal though, as all the normal kids in my year were hell bent on collecting as many luridly coloured magical ponies as they could, complete with long flowing manes and easily lost hairbrushes with which to style them with. It's 2018 now and the ‘My Little Pony’ franchise is showing no signs of giving up. When other colourful fads hit the shops they tend to fade into the background within a couple of months, whereas ‘My Little Pony’ doesn’t want to accept the same fate – this is something like the 16th movie in the franchise to come out, not to mention all the animated series and of course the game that came out in 1998. Unlike a lot of kids movies nowadays this one’s aimed solely the kids, which may be a good or bad thing depending on whether you’re watching it with them or not. Because of this the plot is very standard. Our protagonist, Twilight Sparkle (Tara Strong), is intending to host the annual friendship festival (I imagine just this sentence has already put some prospective viewers off), but her plans are quickly derailed by not-so-friendly Tempest Shadow, a dark and bitter horse voiced by Emily Blunt (perhaps she needed a change? ), and The Storm King (Liev Schreiber), as Equestria is attacked. Of course this means that Twilight and her best friends have to take it upon themselves to save their homeland, and the film nicely concludes with the idea that the friends by your side are always more important in the end. I wasn’t expecting much if I’m honest, but the film itself is actually really nicely animated, and a lot of care has gone into its creation. To keep little ones engaged there’s some nice switches between traditional animation and a more folky style used when narrating certain parts, which aids the storytelling. I did expect the vast range of colours and glitter but they weren’t quite as in-your-face as ‘Trolls’, where I needed to take a couple of Aspirin just to stop my head imploding. Serial ‘My Little Pony’ watchers will already be familiar with the visual style though, and so those bright colour schemes probably offer a certain familiarity with the characters they have more than likely grown up with. 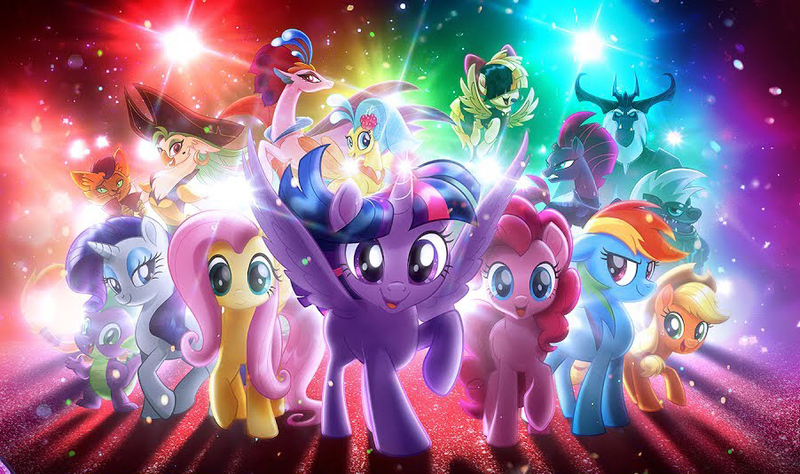 I do feel that they could have omitted the singing element to the film – although this is fairly standard element of a ‘My Little Pony’ movie, the songs themselves weren’t overly catchy and the story didn’t really need them. This could perhaps have cut the screen-time down slightly as well, as 1 hour 45 minutes can be quite a long time to keep a child focused and still. Despite a few issues, there’s still a lot of positivity in the film. There’s some seemingly ill-fitting violence towards the end that might not be quite so welcomed by your small child, but overall it’s a watchable film that will keep them entertained long enough for you to get some well-deserved shut-eye (providing you can block out the high-pitched chatter). 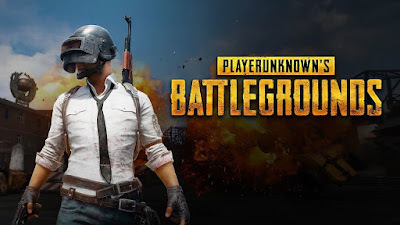 PlayerUnknown's Battlegrounds, (PUBG), is a game type that was inevitable, sooner or later. It just needed the right people to get it done. All hail the mod community. Brendan “Player Unknown” Greene, who is credited for creating the fairly popular ARMA 2 mod DayZ: Battle Royale and worked as a consultant on H1Z1 was recruited by Bluehole, a studio headed by Chang-han Kim to further develop upon his idea that was clearly heavily inspired by films like, the highly regarded, Battle Royale. PUBG drops you onto a massive island, with up to 99 other players. Where you decide to land is all part of the strategy. Once on the ground, with just the clothes on your back, you then have to go in search of the randomly placed weapons and items, to give you an advantage... or at least a fighting chance against everyone else. All of whom are doing the same. The random nature of this can work for or against you. If you land in an area with poor item spawns and you’ll struggle to defend yourself. Land in a highly populated area and everyone will scrabble for weapons and the gunfights will end as fast as they'd started. A big part of the draw to the game is the unease of the unknowing. Every search of a new house, you never know if you'll find a shiny new weapon to use, a backpack to carry more items, health, some armour... or someone camping out inside the bathtub, patiently waiting for unsuspecting scavengers, like yourself. A danger zone keeps everyone on the move, so bathtub person can't just camp for the duration of the game. Every few minutes the Blue Zone closes in, forcing everyone to keep moving and inevitably forcing them closer together. This helps to build tense situations. Running around out in the open is worrying as you have no idea who, if anyone, can see you. Enter a house and it becomes a more personal and close combat situation. Often with people in bathtubs. PUBG makes exceptionally good use of sound design. You'll hear telling pops off in the distance between combating rivals. Listen well enough and you'll hear the shuffle of enemy footsteps, on their approach, to give you time to work out where they are and react accordingly. While the game holds its fun, especially when playing and coordinating with friends on a team, being on a console comes with its drawbacks. Several updates in and the game is clearly an unfinished "Early Access / Preview Program" product that still requires a lot of work to bring it up to a reasonable standard to make it worthy of its price of entry. Xbox one's frame rate is inadmissible, dropping between 15 - 25 fps and the Xbox one X doesn't fair much better, usually around the 20 - 30 fps range. This doesn't help when the controls, that are designed for an accuracy that's not possible with a gamepad in the first place, are fighting against you due to an inconsistent refresh rate and is in much need of an adjustment to help balance the lack of a mouse and keyboard. I'm not just saying this as a PC elitist, it really is that bad. As you and an adversary fire frantically around each other until one of you is either dead or out of ammo. You'll also be tipped off whenever someone is close by, in an area you're passing, by the sudden judder in the netcode. Like a glitch in The Matrix but without the black cat. If you're travelling at speed, over distance, you can be killed by terrain or buildings that haven't fully loaded in yet. While this makes for funny glitches, in hindsight, the buggyness of PUBG will get you killed more than you deserve to be. Maybe wait on Bluehole to fix some of the bugs and glitches, and add in a few more things to do. Currently the Xbox One version only has the one map (making the games pluralised title a lie) and only the one game type. If you have the ability to play the pc version, instead, do that. (It’s still buggy and lacks enough content to keep anyone playing for a good length of time though). This port's not really winning any chicken dinners, just yet.